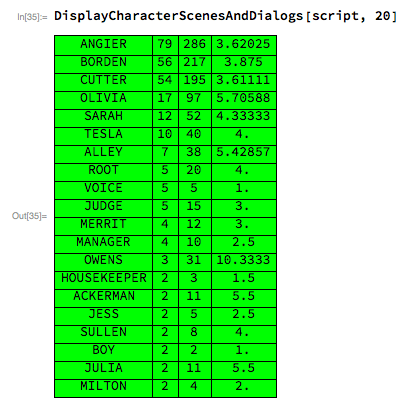 In the previous post I showed how we can use Mathematica to analyse screenplays, and gave some interesting statistics about the various characters and scenes from the movie The Prestige. In today’s post, I want to continue that discussion by sharing some more statistics, and then look at another movie, The Bourne Ultimatum. It is interesting that the top seven entries in the table are the same as in the Dialogs table. 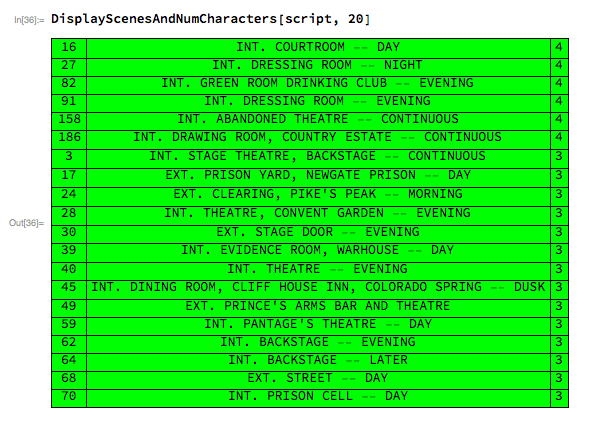 For instance, ANGIER appears in 79 scenes and mouths 286 dialogs. 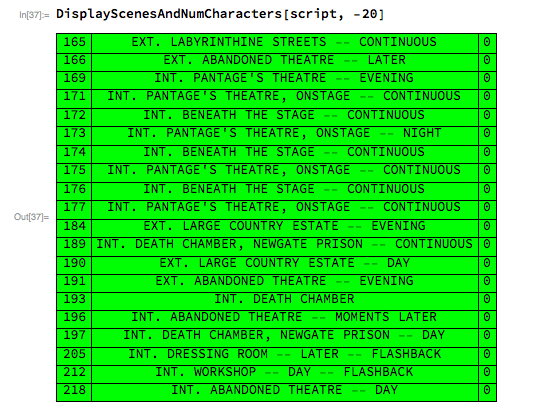 Let us calculate the ratio of the number of dialogs to the number of scene appearances. We see that OWENS has a ratio of 10.33, the largest in the table. This is because, despite appearing in barely 3 scenes, he delivers 31 dialogs. He is followed by OLIVIA, with a ratio of 5.7 (97 dialogs over 17 scenes). Next, let us sort the various scenes with respect to the number of characters appearing in a scene. See the table below. 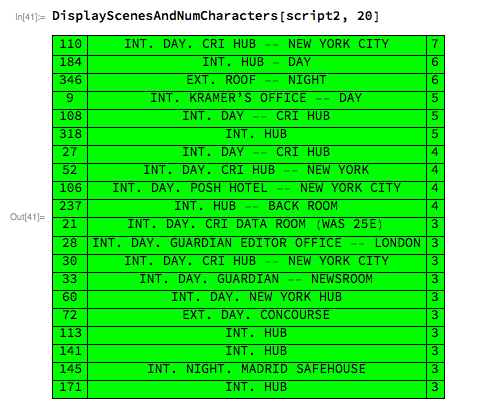 We can see that scenes 16, 27, 82, 91, 158, and 186 all have 4 characters appearing in them, followed by many scenes with 3 characters (this table is incomplete). Are there scenes with no character appearances? Yes. Such scenes typically have action descriptions. 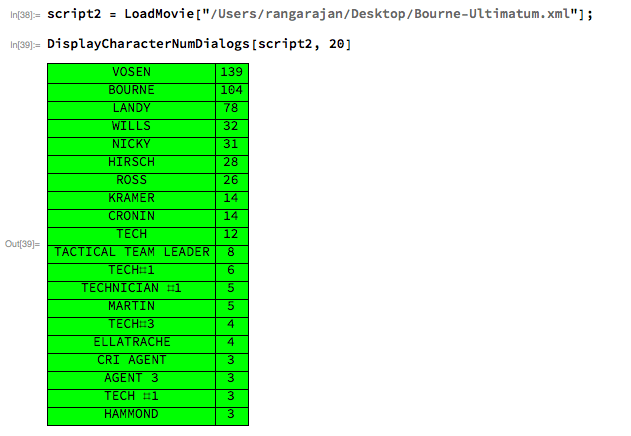 OK, now let us look at a different movie – The Bourne Ultimatum. 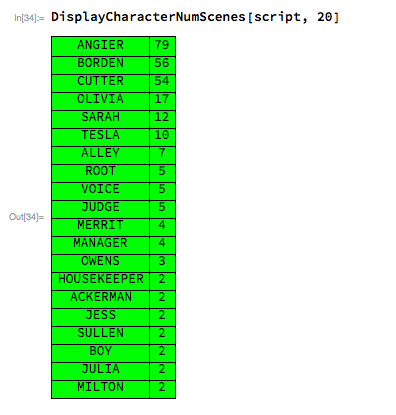 The following table shows the number of dialogs spoken by the main characters. Here also we see the top 5 elements to be the same in both tables. 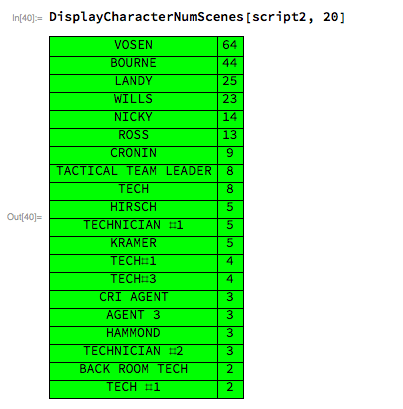 Let us also calculate the ratio of dialogs to scenes. 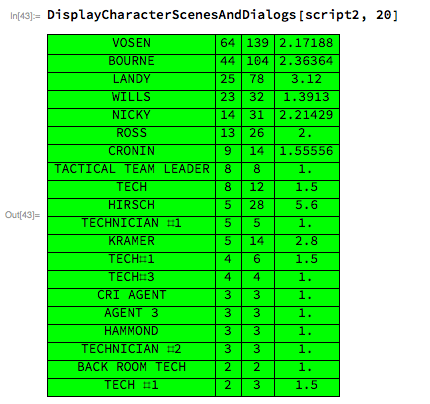 Compared to The Prestige, the dialogs-to-scene values are comparatively less. This could be because The Prestige is a Drama according to IMDB whereas The Bourne Ultimatum is an Action movie. Again, we see that there are scenes that have even 5 or 6 characters, whereas the maximum in The Prestige was just 4. Not sure if this is related to the genre of movies. Further investigation might reveal interesting insights. While it is very tempting to study the scripts even further from a computational point of view, I would like to stop here. If I dig into this some more, I will be happy to share the data with you all. Here is the updated Mathematica source file.